Consider the calendar of Exhibit 8.3. Suppose today’s date is May 10, 2001. Current USD Libor quotes for short maturities are shown in Exhibit 8.4. USD Libor is quoted on an actual/360 simple basis, so basis days are actual days. Let’s construct a discount curve for daily maturities out to 15 basis days. We employ cash valuation. Based upon British Banker Association (BBA) specifications, the overnight rate is for a loan commencing immediately and maturing on the next trading day. The 1-week and 2-week rates are for loans commencing in 2 trading days and maturing on the first trading day that is at least 1 week or 2 weeks later, respectively. Based upon the calendar of Exhibit 8.3, we determine the basis day counts associated with these loans, which are shown in Exhibit 8.5. Exhibit 8.3: Calendar for May 2001. US holidays (nontrading days) are indicated with an asterisk *. Exhibit 8.4: USD Libor quotes for overnight, 1-week, and 2-weeks on May 10, 2001. Exhibit 8.5: Libor indicative interest rates, as compiled by the BBA, correspond to loans commencing and maturing on specific dates. 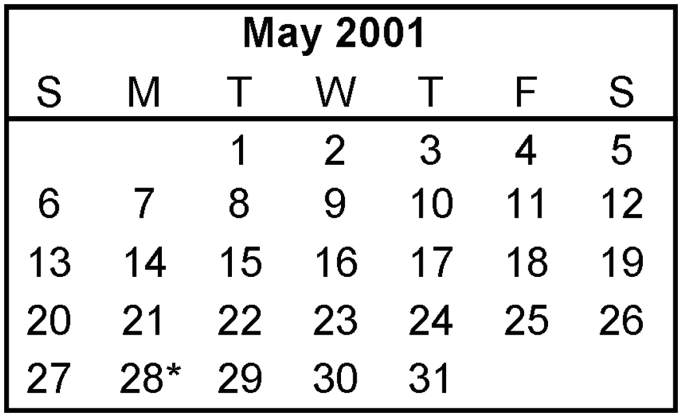 This table indicates basis days from the current date until commencement and maturity for loans corresponding to overnight, 1-week, and 2-week USD Libor quotes as of May 10, 2001. We have 5 discount factors—including discount factor 1.0 for 0 days’ maturity. We linearly interpolate between values to obtain our cash valuation discount curve. Results are presented in Exhibits 8.6 and 8.7. Exhibit 8.6: The interpolated, cash valuation discount curve for May 10, 2001. 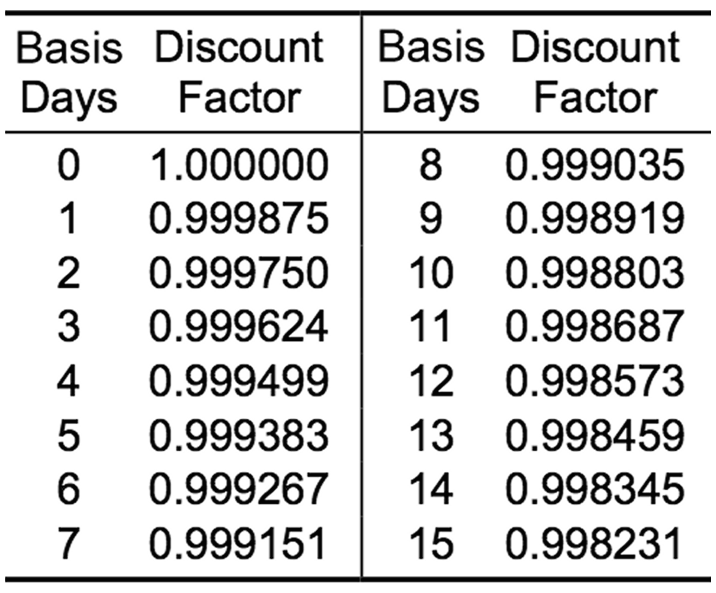 Since we only required discount factors out to 15 actual days, the 19-day discount factor was used in the interpolation but is not indicated. 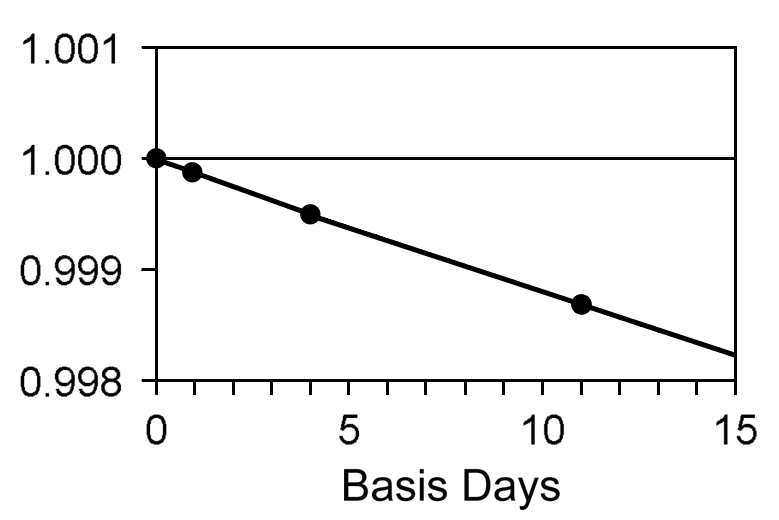 Exhibit 8.7: Interpolated cash valuation discount curve for May 10, 2001.